One recurring question asked in the archives is when did IWU admit students of color? 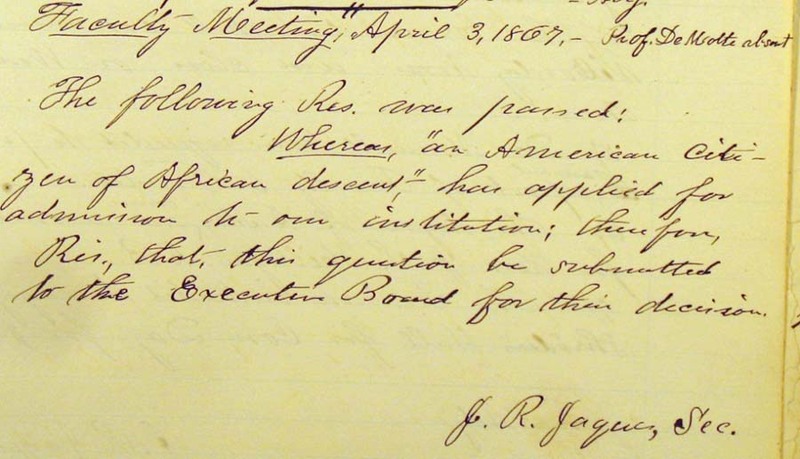 While Illinois Wesleyan may not have been the first school to have a graduate of color, it did admit students of color not too long after its opening in 1850 but not without some prompting. We lack easily accessible information on demographics for early students, but the earliest evidence comes from an argument that played out in a local newspaper surrounding the admission of “a colored boy” to IWU’s Model School (aka, elementary) program. The anonymous letter writer stated that the student’s “request was refused” (The Daily Pantagraph, May 9, 1867, p. 4). The writer makes the pointed criticism that the student was qualified by published standards for admission at the time and questions why a specific vote was needed. His conclusion is that it was due to the color of his skin. Archives Record Group 16-1/10 contains a research file compiled about Black History at IWU, including photo copies of these local news sources, that show a series of commentaries by the writer calling himself “Radical” and one response from then-President O.S. Munsell. We can use the date in these sources for further exploration of the question. We don’t know the name of that student or if he ever joined our campus, but an explicit faculty vote on the principle was successful in April 1867 and the Board of Trustees approved the decision at its June meeting. There is no detailed discussion in any known IWU source about the case, but the culmination of this early effort seems to have finally occurred 13 years later. 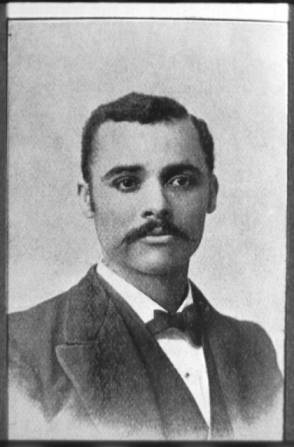 Gus A. Hill is the first known African American student to attend Illinois Wesleyan University. He was a member of IWU’s Law School, Class of 1880. He was mentioned several times in our student newspaper of the era, which was known as the Wesleyan Bee. For instance, in the February 1st, 1883 Wesleyan Bee, the article refers to him as “a colored man and brother.” We have no photographs of Hill in the archives or campus publications. “Alfred O. Coffin, an early African-American graduate of the University, was born to slave parents and went on to become a teacher and college professor.” — Continuity and Change, 1850-2000 by Minor Myers, jr. and Carl Teichman. In 1889, Alfred O. Coffin became the first African-American in the U.S. to earn a Ph.D in Biology. Editors of another student paper titled the Elite Journal, also refer to Coffin as the “talented young colored gentleman” in the April 19th, 1889. Coffin lived in Texas and was enrolled in our version of a distance-education program, so having his presence on campus noted while he was on campus for his final exams indicates contemporary students’ interest in his story. Anyone interested can visit the University Archives to see book one of a two-volume “herbarium” set that Coffin created for his degree completion requirements. That book was discovered just two years ago in a campus office. Book two wasn’t with it but it offers me a chance to remind everyone that while IWU is 165 years old, it is still possible to make unexpected finds, so keep your eyes open whenever the spring cleaning bug strikes! N.B. The first known record of international students enrolling is in 1889 and will be described in the next post. Another “first” was women’s admittance to IWU in 1870, although a discussion about that possibility is first recorded in 1851. Two brief presentations on this topic — one in 2010 and one in 2014 — are available for introductions to that part of our history. To learn more about this topic, or just to visit and marvel at 126 year old plants from A. O. Coffin’s Texas collection, visit Tate Archives and Special Collections in the Ames Library or contact us at archives@iwu.edu!